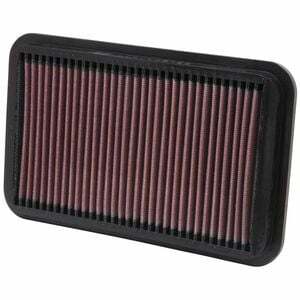 An Engine air filter is that little component in your car which provides fresh and filtered air to your car’s engine. You can think of it as lungs of a car whose job is to clean the atmospheric air from dust particles or other contaminations before it goes into the engine, which you can assume as the car’s heart. So that is to say that air filters are very important for your vehicle to run efficiently. The air filter is a little piece of foam-like material which is permeable for air only and traps dust and debris and prevents it from getting into the combustion chamber. The filter resides in a box called the filter box, which keeps the filter in position, directly above the air intake hose. With time, air filters can get dirty due to the outside air filled with dust and other particles in the air. In that case, your car will not perform as efficiently as it should and this means it’s time to either clean the filter or replace it. 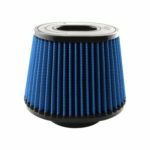 Although cars come fitted with OEM filters, there are lots of high-quality aftermarket filters which can boost the performance of your car. We have done the hard part of gathering information about the best air filter out there for you to choose from. If you want to learn a bit more about air filters before purchasing one, check our Buyer’s Guide and FAQ in the bottom of the article. Scroll down or click here to go to it. Although it’s important that you get just the right size for your air box before buying. FRAM is a name well known. It stands as one of the high-quality manufacturers of air filters for cars. So if you are looking for an air filter for your car, you need to look no further as FRAM has you covered. FRAM has in store all kinds of filters of various fittings and sizes. You will not have a problem in finding the best fit for your particular car’s make and model. FRAM filters are known for its unique colour blend consisting of white and orange colour which makes it presence known to everyone peeking inside the hood. The housing of the filter is usually coloured orange while the filter itself gets the white colour. 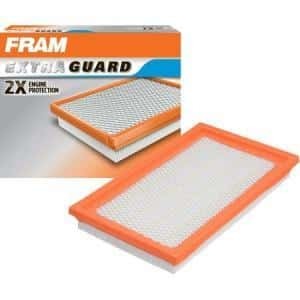 FRAM makes their filters which looks distinct from many other air filter makers and even OEM filters. The filter has a cardboard feel to it, featuring a wavy pattern in the middle (the filter part itself). FRAM’s Extra Guard features an aluminium mesh which ensures greater filtration of air. All this doesn’t obstruct any air at all but makes the incoming air cool. FRAM filters range from 10 to 15 dollars but it really depends on which car you own. FRAM filters amazingly boost your car’s performance, increases engine protection and overall performance. It is advised to change the air filter after every 12,000 miles which will keep your car’s performance up and your engine’s airflow clean and unrestricted. You can find a better guide in the product’s manual on how to maintain or when to change/clean the air filter. Air filters by FRAM trap twice more dust and debris inside the filter than many other brands and even OEM filters. With the help of microscopic fibres in the filter, even the tiniest dust particles get trapped inside to prevent influencing the air-fuel mixture. It is advised by the brand to change the air filter after every 12,000 miles. In addition to providing clean air, this results in less engine wear and increase in performance. Mann filters are one of those brands which will want you to test it in your vehicle when you see it. It is one of the popular brands like FRAM. Although when it comes to the price, Mann costs slightly higher than FRAM but claims 100% on its quality and performance. Unlike FRAM, Mann filter doesn’t have a colour scheme but who cares about the colours anyway? Mann is no doubt a premium quality air filter your car would love to have. Mann has a wide range of filters which range differently in quality as well as pricing although that doesn’t imply Mann has low-quality filters too. The actual deal is that these filters vary in price and quality according to a car’s make and model. You can expect the same from all Mann filters. Catching tiny dust particles and debris to not compromise engine performance. Mann filters do their job a 100%. No matter if its dust, debris, microparticles in the air or soot, Mann is the safeguard which will keep all these substances away from your car. As a result, you get a quick boost in the engine performance, response and acceleration. These filters will not only prevent your engine from harm but also keep safe all those electronic parts and various sensors sitting under the hood from damage. So what does this little piece of filter really do? It actually optimizes the air and fuel mixture managed by your car’s computer so that you automatically get the best power output and improved gas mileage since many times, in the case of bad mileage, the air provided to the engine is bad. Although to keep the upgraded performance at its peak, you will need to check the filter from time to time. If it’s too dirty, you will need to clean it. 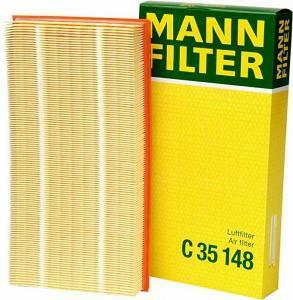 If you need a quality filter, Mann is got you covered. Dust aside, Mann filters will go as far as to keep your engine away from water or moisture even, that might have somehow made it in your filter box or maybe the car sucked it from the outside air. K&N is a name simply associated with pure performance. K&N filters are purposed a little different than other filters. They are made to serve the very purpose of boosting your car’s performance. The primary purpose is not just a simple filter but a performance oriented filter to make your car fly. K&N filters take a different approach. These filters are oiled which actually increases the airflow when compared to dry air filters. The making consists of cotton and cloth used together to make the filtering just perfect and accurate. With these advantages and upgraded, a little maintenance is added too. K&N oiled filters are required to be oiled again after being used for more than 30,000 miles. That will ensure that the filter keeps performing at its fullest. A simple concept that the more air engine gets, the more fuel is added to the mixture and the more power the engine outputs. And as we mentioned earlier, how the job of K&N filter is to boost the performance relates to this. K&N filters increase the air intake which in return boosts your car’s given output. With all that raw power, you would want to go fast and K&N filters should make it possible for your car. K&N’s air filters simply increase the air intake of the engine in addition to providing it clean and fresh air free of particles and dust. The best thing about K&N filters is that they can be cleaned and re-oiled, increasing its life so that the paid amount is worth it completely. 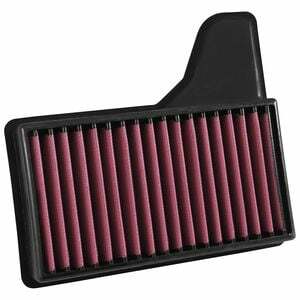 K&N has the right filter for your car so that you don’t need to change your car’s filter box. Increases engine’s air intake for upgrading in performance and acceleration. Can be re-used multiple times without degrading in quality. Purolator is one of the oldest brands which has been in the market for quite some time now. Purolator is known for not just its air filters but other types of filters as well such as oil and fuel filters. They are obsessed with high quality and thrive to keep your car performing like brand new for a long time. Purolator is one of the brands you can definitely go after without a second thought with its comparative pricing and quality. 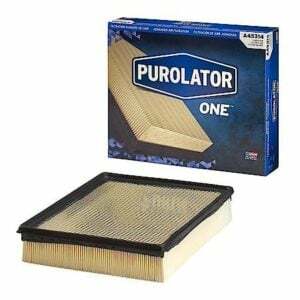 Purolator’s price tag for the air filters ranges from 10 to 25 dollars depending on the car you own. The price of filter for the exact make and model could cost more or less. If you have a relatively newer model car, the cost will be in the higher range and vice versa for older vehicles models. Purolator recommends to service/replace your air filter after a year (depending on your use and region of use) or after ever 12,000 miles driven. Cleaning or replacing it will ensure maximum engine performance and also prevention of unwanted engine wear and tear. Purolator claims a percentage of 99 that its air filters manage to catch almost all the dust and debris that may be coming in from the atmosphere. It also says that their filters improve your car’s gas mileage. Whichever car model or make your own, Purolator has the best fit for your car so you don’t need to worry about adjusting the filter forcefully. Prevents load build up on the engine due to dirty or restricted air. Reaching their 100th year birthday in 2016, ACDelco has been around because of the year 1916. Just like Purolator, the name ACDelco has also lived long enough to be known by many. 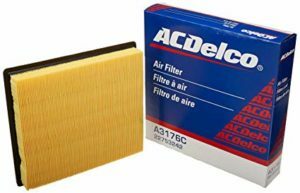 ACDelco is known for making lots of high-quality car parts and components and their air filters are one of their best products. 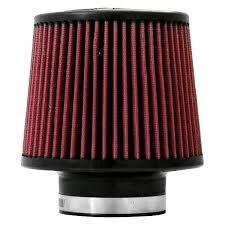 These filters have a proper seal around the filter edges and ensure a boost in performance of the engine with an increase in mileage. We recommend that you first check the filter so that it fits properly as an improperly fitted filter will be of no good to your car. ACDelco’s 100-year record isn’t just for say. The brand lives up to its claims of high-quality parts and delivers what it claims. That being said, ACDelco is a brand not only known in the USA but also in different parts of the world. ACDelco filter is a performance filter and bound to improve your car’s acceleration response. Its filter quality is just excellent as it catches even the smallest dirt particles and prevents it from getting into the engine. Makes the outside air coming in as clean as possible without any contamination. Its tight seal prevents air from leaking in or out which is also a doorway to dust and dirt. AiRaid is a brand known for its usage of the best quality material used to make the products. Airaid is one of those aftermarket air filters which isn’t just for the show. It is made from the best quality raw materials for the housing and the filter itself. The Airaid filters consist of layers of cotton gauze with a special fibre called the SynthaFlow whose purpose is to effectively catch maximum dust and tiny particles in the air. Airaid says its filters can go for as long as 50,000 miles driven before it needs to be cleaned and used again. Airaid filters are known to be used with cars having swapped LS engines due to its variation in the intake and other technical needs. These filters fit accurately with the LS engine’s filtration system. That being said, Airaid stands to be one of the best quality air filter makers which boost your car’s intake and thus the performance of a powerful and economical ride which is more inclined towards performance. The name is associated to be used with LS engines in particular though. These filters are reusable and can be easily cleaned. Airaid filters are made with high-quality material to filter the air efficiently and to increase the air flow to the engine. Airaid is made with materials which don’t let the filter housing crack under high temperature. Simply, these filters are made to last for long and can be revitalized by timely cleaning and serving to increase the filter’s overall lifespan. Injen is a popular brand known and a favourite of many owners with high-performance cars. Injen’s products are widely used for domestic as well as professional use. Injen filters have multiple filtration layers ensuring the greatest blockage of dust. Injen has just the right filter size for your car and you can easily install it in your car yourself. Injen too is made up of cotton gauze for its filter part. To say a little more about the brand, it is based in California in Panama. It was associated with the then-popular brand RD Metal Works in 1998 which used to design and manufacture air intake kits for major brands selling high-quality filters and intake systems. Injen filters are easy to clean and reusable. Injen gives a lifetime warranty on all of its filters. Features a multiply layered filters with the filter oiled. aFe air filters are recognized by their makers. This is another filter brand that uses the cotton-cloth gauze for greatest filtration of dust particles and debris. The restricted airflow is increased and the filter allows the engine cleaner and greener air to perform at its best. aFe filters are wet filters (oiled) and can be re-oiled and used again. These filters can be cleaned and washed by household detergents and soaps and after a good clean go back to being 100% efficient. AEM Dryflow filters omit the trouble of oiling it again and again as the filter is dry but just as efficient as wet filters. Using synthetic technology, AEM’s dry-flow filter ensures max protection against dirty air going in the car’s intake system. Most importantly, AEM’s filters work at its maximum for as long as 100,000 miles driven which is great for many owners who are lazy at performing regular maintenance of their cars. AEM also offers a lifetime warranty on its filters. Using Volant’s ProGuard air filter will definitely have your car flying as the meaning of its name suggests. ProGuard filter will filter the air for your car as best as other popular brands on this list and won’t let you down in terms of quality and price. Along with that, Volant’s air filter also claims to increase your car’s gas mileage as well as overall performance. Volant’s design makes the intake of air smoother producing less heat in the process. Which filter is right for my car? If you don’t know already, a car’s engine relies on a lot of things to work but out of all those things, 2 major things stand out, one of which is fuel and the other being air. The mixture of the two is what makes your engine work and as a result make the car move. Just as clean fuel is important for your engine, same goes for air which is why car makers include an air filtration system in the first place. All that being said, the answer to which filter is good for your car is simple. The function of an air filter is rather simple although really crucial. To filter air. Normally, we don’t see the dirt in air but rather we feel it in the eyes. Air contains tiny dust particles from the atmosphere and although tiny in size, can greatly influence the mixture and car’s performance if it gets into the combustion chamber. Your car will not only face decreased performance but also engine wear which can cost you big in the long run. That being said, the answer to which filter is best for your car is simple. The functions cannot vary but only the quality and price. The purpose for any filter is one. To clean the air for your car. The best filter for your car is the one that fits your filter box perfectly. Do aftermarket air filters really make a difference? Does frequent air filter change improve engine life? Yes. As outside air is never really clean, dirt can build up overtime and clog the filter which can directly impact the amount of air coming in the engine. That will affect the performance and mostly the gas mileage as the air-fuel mixture wouldn’t be proportional. By frequently and timely cleaning the air filter, you can ensure top performance by your engine and long life of your filter. How do air filters affect emissions? When air flow is restricted, more of gasoline will burn and the emission which contain more fuel than air which is a big pollutant of air. Modern cars are equipped with a computer which decides how much fuel to add according to air. If air is restricted, fuel will be restricted and so will performance. What are the signs which tell that my air filter needs replacing? The first and most obvious sign is a dirty or blackened air filter. If upon inspection, you find that your filter is simply dirty, it is time to clean it. If your air filter is very old, it may be time to change it altogether and replace it with a new one. Another sign is a decrease in mileage. If you realize that your car is using more gasoline than it used to, it may be due to a bad air filter. In that case, inspect your air filter to see if it’s dirty. It may also be torn. You start your engine and find out that black smoke is coming out of the tail pipe. Although this could be due to many different reasons, one of the reason is a bad air filter. That happens if your car isn’t getting enough air to burn with fuel. If you air that your car makes a ‘whiff’ sound as you step on the gas, that’s a sign that your engine is having a hard time getting air. That’s a sure sign that your air filter is blocked and restricting air flow. How can I change/clean the air filter on my car myself? The air filter box is easy to find in almost every vehicle. It is usually right above the spark plugs or on the right in the engine bay. The filter is fitted inside a box which is either clipped or tightened with screws. Unclip the top part of the box and take the filter out. Check for any damage. If it’s good, you can just clean and it put it back in. Some filters can be cleaned simply by tapping them to remove the dust over the filter. To thoroughly clean the filter, you will need to wash it with a soap or detergent. Although you should refer to the owner’s manual if you are cleaning your OEM filter. If you are cleaning aftermarket filter, refer to the instructions given by the manufacturer of the aftermarket filter to not damage the filter. Buying the correct air filter means buying the right size for your filter box. If your new filter isn’t fitting your filter box, it’s wise to not forcefully install it as it will be useless to do so. A filter box is tightly sealed which serves the actual purpose of filtration. Air is gathered in bulk amount and accumulated in the box. The outside force pulls the air in the engine but as the air is being pulled, the air needs to pass through the filter itself which decontaminates air before it can get to the combustion chamber. There is no space inside the filter box from where the air can leak out or can be let in. If that were so, dirty air could get inside your engine and render your filter useless. The deal with air filters is actually very straightforward. Air filters are one of the important components in your car whose function may be simple but is very important in the efficient working of the engine. Air filters are inexpensive so you don’t need to worry too much about replacing them frequently. But because of technology, even that has added benefits. Air filters, especially aftermarket ones, are now more rigid and long lasting. Some work for as long as 100,000 miles. Besides that, modern filters can be reused and cleaned multiple times to take away the hassle of replacing them frequently. With all that in mind, maintenance of air filters should not be overlooked as, saving a few bucks on filters could lead to having you spend a big amount on engine repairs due to failure of parts and air sensors. Not only that but you will face low performance by your car.